Today, Thursday August 13 the only flower which grows on tufo, or tuff rock began to bloom: the Palio di Siena. This is an evergreen plant which blooms only twice a year, once being at the height of summer on the 16th of August for the feast of the Virgin Mary’s Assumption. The flower emanates an intoxicating, giddy perfume for local residents and visitors alike. The Palio is not a sporting event, and it isn’t just a horse race. 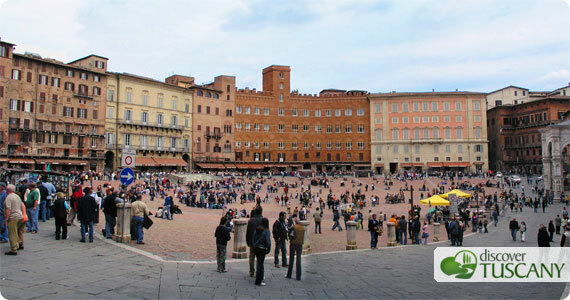 The event is a tournament from the past that continues to still evoke great passion in the people of Siena. You have to see it to believe it. Today, Fortune has assigned the horses to each contrada, or district, within the city. It is yet again Fortune, supreme lord of the Palio, that has also decided to place 4 sets of bitter enemies on the square: Porcupine and Wolf, Wave and Tower, Eagle and Panther, and Owl and Unicorn. The Giraffe and the Snail, which complete the line-up, will be courted by all the others and might even have an advantage in the race for not having a sworn enemy running in the same race. The best horses are those which have already run a past race on the magnificent square in the heart of Siena and which have been assigned to the Giraffe, Eagle, Owl and Unicorn districts. All the others will be debuting on Sunday. The outcome of this Palio race is uncertain and challenging as a consequence of the decision by the captains of each of the districts to not allow horses which have won past editions compete (the “bomboloni” horses, as they’re called by Siena residents). Running in this edition are the two districts that hold the record for longest time without a win: the Owl district has not won a Palio in 30 years and thus unhappily can boast of the title of “grandmother” while the Wolf district has not won in 20 years and thus wants to avoid inhering the “bonnet” if the Owl were to to win. This Palio presents another unique characteristic: the beautiful drappellone, or large painted drape that is the prize that goes to the winning district has been designed and painted by a Florentine artist! We weren’t there but we are pretty sure there were a few seconds delay in the applause that met the presentation of the work of art a few days ago given the long, ancient animosity between the two cities and its citizens. The “waltz” of the mounts or assassins (as the horse jockeys are called) and the agreements and understandings for and against other districts has begun. Nowhere else in Italy is a rule more broken (and even experience in breaking it is boasted of) than Article 89 of the Palio regulation that says: any type of direct agreement or understanding to allow one district to win over another is strictly forbidden. But if all rules were to be respected, but sort of tournament would it be? So goodbye and arriverderci on the afternoon of the 16th when even, a popular saying recites, souls from past Sienese have special permission to watch the show from heaven. A note of warning to all visitors: it is necessary to see the Palio in order to start understanding it but that isn’t enough, you need to live it. If you are planning to attend, make sure to see if you can gain access to some of the other ceremonial rites surrounding the Palio that take place in each of the competing districts. That’s where the heart of the Palio resides.